Home Events Weekly Photo Challenge ICATS Weekly Photo Challenge- Week 17- What Are You Reading? This Week’s Theme- What Are You Reading? Whether it’s a novel, the newspaper, our Facebook feeds, or a big old stack of research papers, we are always reading something. Reading is an essential skill that we often take for granted, but imagine how challenging our lives would be if we hadn’t had the teachers and mentors who taught us how to read, understand and communicate through language. It’s how we learn, and it’s how we tell our own stories. This week we are looking for pictures that answer the question, “What are you reading?” Share with us the many instances in which you use this skill everyday. 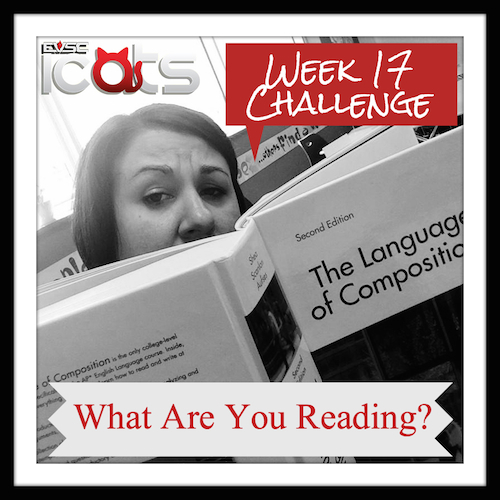 Show us what you read for pleasure, what you read professionally, and what you read with your students. Share a picture that includes a favorite quote or a picture of the book you wish everyone would read. Help us tell the #EVSCStory by sharing the stories that grab your attention as you go about your day. The photo was cropped in iPhoto and edited in Fotor, a great web app for photo editing. You can share via Instagram- Simply post your Instagram photos using the hashtag #EVSCstory. Feel free to add other hashtags as well to indicate the theme (e.g. #Read), or add more information to the caption to help tell the story.